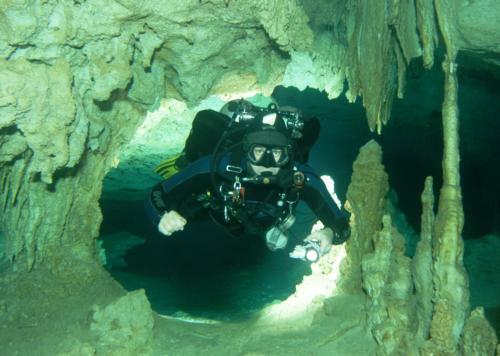 After a week of drift diving in Cozumel with my wife and Alison, I headed to Puerto Aventuras for the final portion of my full cave certification with Steve Gerrard. Steve is a great instructor with a fun personality and lots of stories... He’s been cave diving for 30 years and teaching for about 25. If you want to know about him, visit his website http://www.deephorizon.info. Day 2: First dive at the Cenote of the Sun (Naran Hal system). 91ft, 70 min bottom time and 9 min deco, EAN32. This was a fantastic cave. Long halocline like a mirror for about 100ft. Amazing white/bleached limestone and blue water. Beautiful cave ceiling and floor with thousands of formation. Great cave, definitely the best one so far for its beauty. 2 T’s and 1 jump. Second dive was my full cave graduation dive. We manage to do the traverse from Calimba to Bosh Chen on third. I led on the way in. We had a chat at Bosh Chen with the bats and Steve led on the way back while I pick up the spools and markers. 44ft, 84 min; 2 jumps, 1 T. Most interesting passages with restrictions, fragile formation, amazing ceiling and very large rooms.